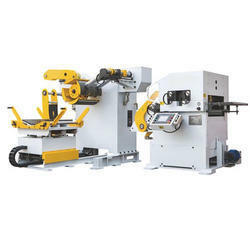 PRESS ROOM AUTOMATION releases its first “3 in 1”, which combines a decoiler and a straigthener-feeder on a single base. - 3.4 meter long one piece base. - Easy and quick to start up. - Transferable to another press. * Uncoiler with manual / hydraulic jaw expansion and variable drive & loop control system. 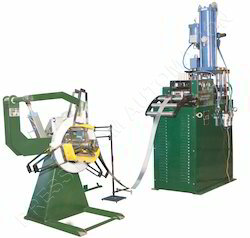 * Hydraulic / pneumatic hold-down, snubber and piller for threading is available on request. * Optional Coil car is available on request. * Coil width guide manual/automatic. * Models uptill 1300 mm width and thickness uptill 8 mm is available on request. * Feed Height adjustment is provided. * Coil tip flattener roller is available on request. The above parameters are for the material having tensile strength 40kgf/mm² max. PRESS ROOM AUTOMATION releases its first “3 in 1”, which combines a decoiler and a straigthener-feeder driven via servo motor.It targets manufacturers seeking a simple, robust and safe press feeding line with decent performances. - Strip thickness from 0,3 mm to 3 mm. - Feeding Rate up to 100 Spm. - Pitch accuracy: ± 0,15 mm. - Rotation jog mode from main control box. - Stabilized Steel frame construction. - Cascade Rollers @ Entry. 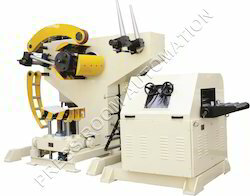 - Gear driven feed roll to ensure non-slip positive feeding. - Straightener Head consisting of Straightening Rollers. - Exit Width Guide Assembly. - Permanently sealed precision roll bearings, no lubrication required. - Motorisation through one brushless servo motor and precision gear box. - Crocodile opening of the head by lever, for safe and easy roll cleaning, and easy strip insertion. - Manual height adjustment by hydraulic jack +/- 100 mm with 2 height of pass-line. Looking for NC Leveller Feeder ?